From the 1922 Rattler, Raleigh High School’s yearbook. Part of a photo essay of Raleigh. The Digital Heritage Center partnered for the first time with the Olivia Raney Local History Library in Raleigh to digitize nearly a hundred Wake County school yearbooks, catalogs, reunion books, and graduation programs. The materials, which span 1909-2008, are windows into the daily lives and times of North Carolinians throughout the century. Some of these yearbooks come from schools no longer in operation. Here, we’ve provided a brief history of each former school (when available), and a link to the volumes from that school (see section “Closed Schools” below). We also digitized yearbooks from schools that still exist today (see “Current Schools” section at end). 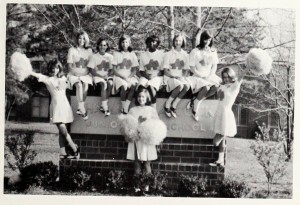 Aycock Junior High School Cheerleaders, 1969. History: Junior high school in operation from 1965-1979, when its campus was absorbed by William G. Enloe High School, which was built in 1962. The building was and still is known as the “East Building” on Enloe’s campus. Its original students were from the recently closed Hugh Morson Junior High School (formerly Hugh Morson High School). 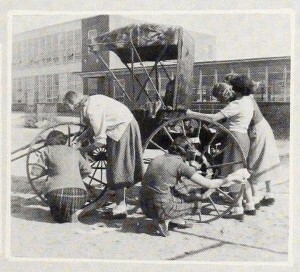 Students of Fuquay Springs High School at work, 1953. History: Three elementary schools in the area joined together to open Fuquay Springs High School in 1918. The was renamed Fuquay Varina High School in 1963 and operated until fall 1970, when it combined with Fuquay Consolidated High School to form the new Fuquay-Varina High School. That school is still in operation today (history from Fuquay-Varina High School website). 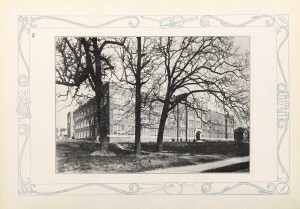 Hugh Morson High School, 1928. History: On September 2, 1925 the students of the overcrowded Raleigh High School moved into the brand new school called Hugh Morson. The school spanned the block of Morgan Street bounded by Person, Blount, and Hargett Streets. It was named for the long-time teacher and beloved first principal at Raleigh High School, Mr. Hugh Morson. Today, all that remains is a plaque and two gargoyles. The school newspaper was The Purple and Gold; its colors, purple and gold. These colors live on today as the colors of Needham B. Broughton High School (more details in this Good Night Raleigh post; history summarized from an excellent entry in Historical sketches of the Raleigh Public Schools by Mrs J. M. Barbee, 1943). Hugh Morson High School was demoted to a junior high school in 1955 and operated until 1965, when it closed. 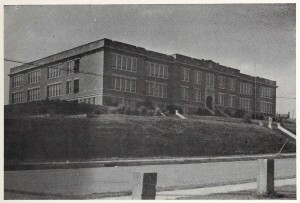 Over winter break in 1965, the students were transferred to the new Charles B. Aycock Junior High School and the school was officially closed and demolished in 1966. The Raleigh High School building on W. Morgan St, 1923. The school closed in 1929 and was later demolished. 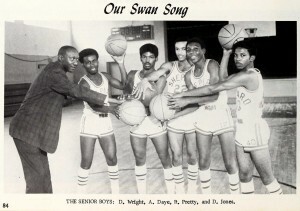 Shepard High School boys’ basketball seniors, 1970. History: African-American high school from 1933-1970. Wakelon High School, side view, 1948. History: Wakelon School opened in 1908 in an “eclectic brick building” in Italian/Neoclassical style (National Register of Historic Places; the building was added in 1976). 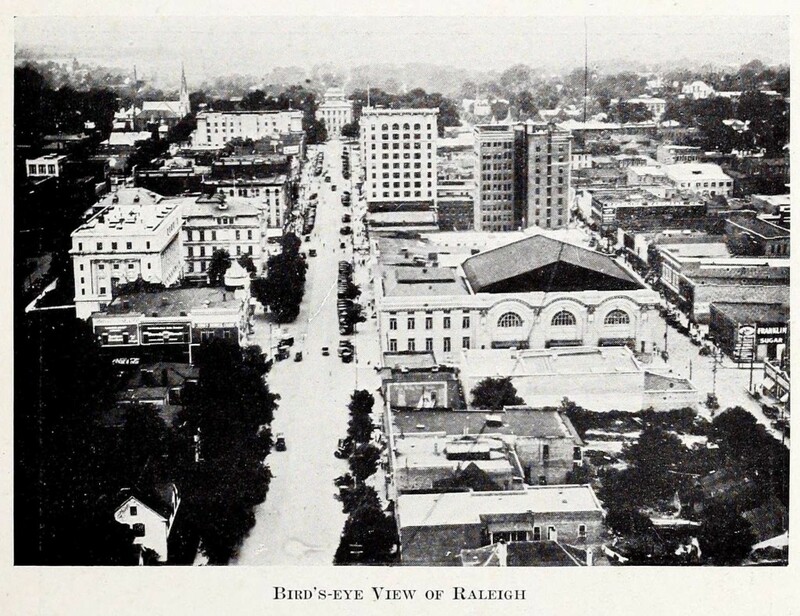 It was designed by C. E. Hartage, a Raleigh architect, and features a prominent center octagonal tower. The school’s construction was a big boon for the town of Zebulon, which was incorporated just a year before the school’s construction. 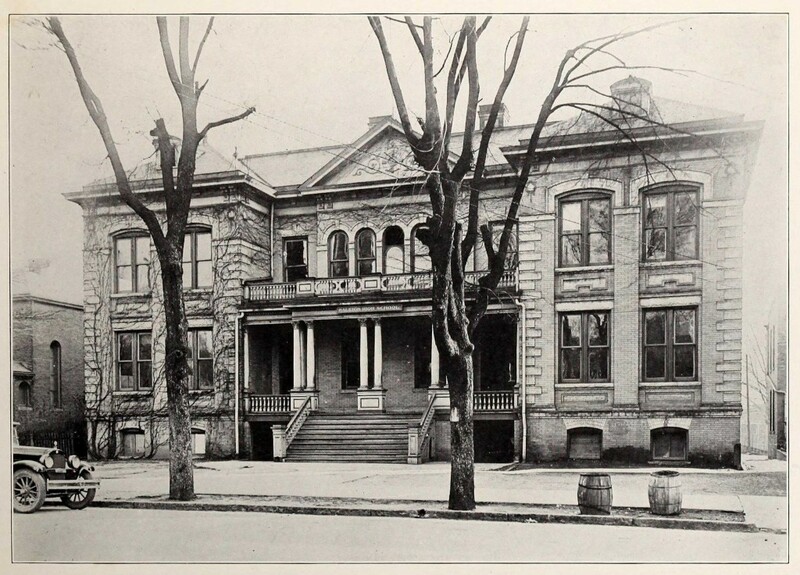 Its construction was a result of the 1907 General Assembly act that also established Cary High School. It operated until it was merged with the integrated Zebulon Elementary. The last of the students graduated in the 1980s, and the building was sold to GlaxoSmithKline. It has since been bought back and is now a town hall (News and Observer). Washington High School building, 1945. History: In 1869, a school for African-American students was built at West South Street in Raleigh by the American Missionary Society of New York. The school was bought in 1875 by the city of Raleigh and organized as a public elementary school. The school grew, but by 1918 Shaw University and St. Augustine’s College had both discontinued their high school programs, leaving black students nowhere to pursue education beyond the elementary level. In the fall of 1924, Washington Elementary and High School opened (Historical sketches of the Raleigh Public Schools by Mrs J. M. Barbee, 1943). It was designed by C. A. Gadsen Sayre in the Jacobean style, a popular style for school architecture in in the 1920s, and continued as the only public high school for African Americans in Raleigh from its inception until 1953 (source). The building now holds Washington Gifted and Talented Magnet Elementary School. Now the Governor Morehead School for the Blind. To view all of the new Wake County materials, click here.